DALLAS, TX--(Marketwired - Apr 20, 2016) - New Parks Associates research reveals low technology adoption and app usage among caregivers in U.S. broadband households, where 76% own a smartphone and less than 40% of them use an app to assist with caregiving tasks. 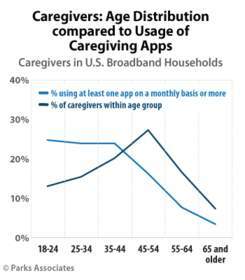 The low app usage aligns with the age distribution of these people who care for an elderly or frail family member. Twenty-seven percent of U.S. caregivers are ages 45-54, but this age group accounts for only 16% of the app users. "Caregivers ages 18-24 are 28% of the caregiver population but account for half of the app users," said Harry Wang, Senior Director of Research, Parks Associates. "Caregivers who are in the 45-54 age bracket may not be as inclined to use apps as their younger counterparts. Companies need to encourage this consumer segment through app discovery and training that demonstrates the benefits of these solutions." Forty percent of caregivers who do not use apps find the emergency alert feature "very appealing." "We will see rapid adoption and usage as caregivers become more comfortable with apps and other connected healthcare solutions," Wang said. "Consumers in the 35-44 age range are a key bracket. Those currently at this age will bring apps with them as they take on more caregiver responsibilities for their aging parents. At the same time, younger consumers will age into this segment, and these Millennials will lean heavily on mobile and connected technologies as they prepare to tackle caregiver challenges in their families." Independent Living Needs: Helping Aging Parents Thrive looks at the needs of caregivers, technologies to assist them, and the role of caregiving apps and connected health solutions to improve aging-in-place and independent living. Parks Associates will address these key issues at the third-annual Connected Health Summit: Engaging Consumers, August 30 - September 1, 2016, at the Omni Hotel San Diego. Consumer usage and technology innovations are core topics at the event, which spotlights health technologies as part of the IoT phenomenon and the transformational impact of connected health solutions on the U.S. health system. More information about Parks Associates' research is available at www.parksassociates.com. To schedule an interview or to request specific research data, please contact Holly Sprague at hsprague@gmail.com.